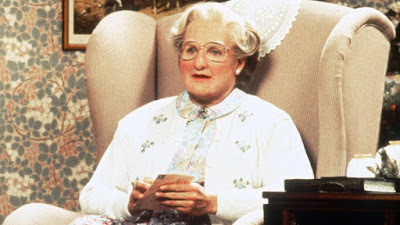 Robin Williams spends the bulk of Mrs. Doubtfire demonstrating the many acting talents from his own résumé as his character vies to retain custody of his children in the guise of an elderly female housekeeper. The perfect vehicle for a beloved entertainer with a deep well of voices and slapstick chops, this poignant divorce dramedy sees the comedian don matronly movie makeup to prove his paternal prowess and remind us why he felt like a filmic father figure to a generation. In keeping with the theme of family, we welcome our first guest appearance from a sibling! Eric's sister, Amy Ambler, joins us to bring the fourth and final round of our Robin Round Robin full circle with another Williams classic. He's the true champion in the eyes of these nostalgic podcasters, but we invite dissenting opinions! If Mrs. Doubtfire teaches us anything, it's that people can have their differences and keep their distance... and that's okay.